Do you want strong and stable shoulders that are less likely to get injured? If so then here are 7 overhead static kettlebell exercises that you need to know. Shoulder injuries are extremely common and many of them can easily be avoided simply by strengthening the shoulder stabilisers before the main prime mover muscles. 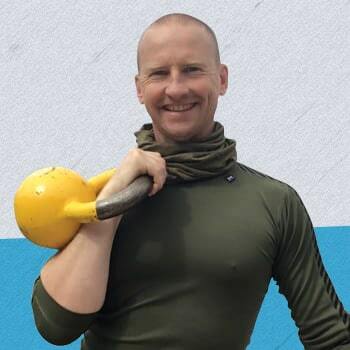 Below I’ve listed 7 kettlebell exercises for you to use to improve you shoulders resilience. If you want develop strength and power without the worry of injury then you need to progress your shoulder exercises correctly. Within your body you have a selection on stabilising muscles along with prime mover muscles. Stabilising muscles are responsible for holding your frame in the correct position while your prime mover muscles produce the bulk of your strength and power. For example, the rotator cuff muscles of the shoulder can be considered stabilisers whereas the deltoids are the prime movers. It is important to note that there is a cross-over between roles of the muscles, some prime mover muscles help to stabilise and other stabiliser muscles assist with movement. Conditioning the smaller and weaker stabilising muscles before the larger prime mover muscles will prevent future injuries. The best way to strengthen the stabilising muscles is to hold a kettlebell overhead preventing the overuse of the prime movers and stimulating the smaller stabilisers. Once you have developed a strong framework with the stabilisers you can then progress on to the dynamic overhead exercises. So just to recap, develop a resilient framework of stabilising muscles first with overhead holding exercises before progressing to more aggressive prime mover exercises. Below you will find 7 overhead holding kettlebell exercises that you should use to condition your stabilising muscles before progressing on to the more aggressive dynamic exercises. If your goal is to press a 24kg kettlebell overhead then you should first practice holding a 24kg overhead. The kettlebell overhead hold and then walk is the best place for beginners to start. As mentioned previously you need to go through a progressive conditioning process that focuses on the shoulder stabilising muscles. There are two progressions to this simple but very effective overhead exercise. First you should begin with the basic overhead hold. Hold a kettlebell overhead with your wrist straight, elbow locked out, and shoulder back and down in its socket. Keep your shoulder away from your ear. The second progression involves taking a walk with the kettlebell held overhead. Take action: use a kettlebell that you plan to press overhead. 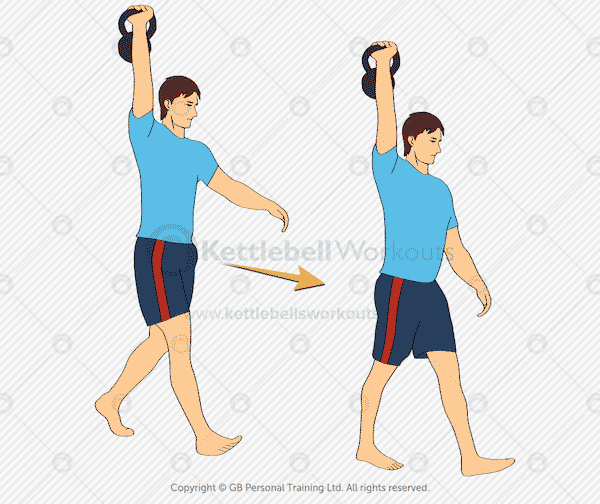 When you can hold the kettlebell for 30 seconds progress to walking with the kettlebell overhead. 60 seconds of walking with the kettlebell overhead on each side is a great goal. 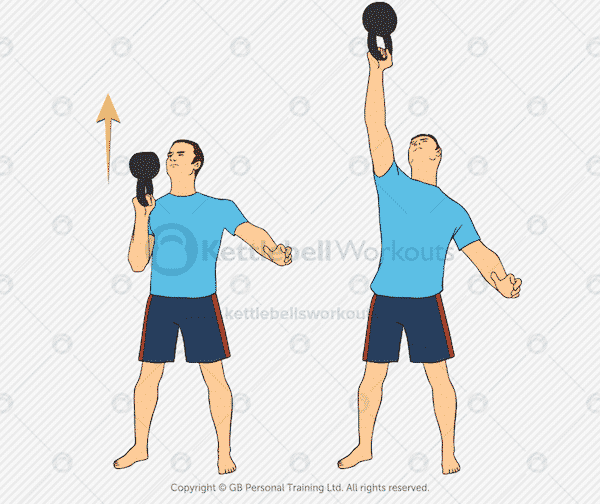 The kettlebell overhead warm up takes the overhead static holding position to the next level and adds further stabilisation demands. The same holding technique applies to all overhead exercises, locked out elbow, straight wrist and shoulder down and away from the ears. 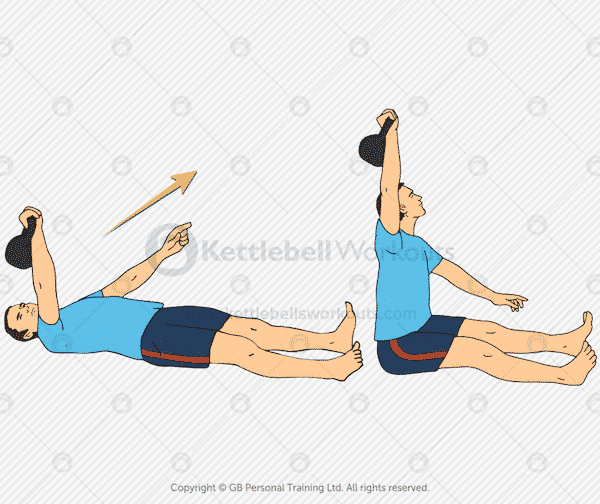 The overhead warm up exercise will work on your shoulder stabilising muscles and also warm up the hips and legs. From the overhead position take one leg back into the reverse lunge, then the second leg back to the tall kneeling lunge position. Next, reverse the movement placing one foot forwards and then stand. Keep your core braced and tight through the complete exercise and prevent your lower back from overarching backwards. Take action: progress to 5 – 10 reps before changing sides. Mix up the sequence so you change which legs are used to stand up from the tall kneeling position. The kettlebell windmill will condition the shoulder stabilisers from different angles along with conditioning the core and hamstrings. 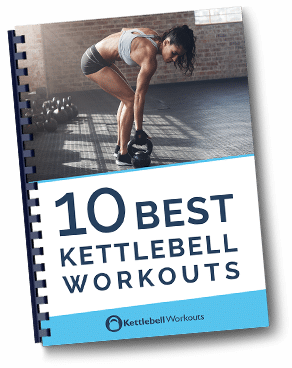 Unlike the two static kettlebell holding exercises listed above the windmill works the shoulders through a rotational movement. The shoulder stabilisers have to work hard as the arm stays vertical and the body is rotated underneath the kettlebell. Keep your eyes fixed on the kettlebell at all times. The rear leg should remain straight and the front leg can have a slight bend at the knee. Push your hips backwards as you load the hamstrings and reach down following the line of your front leg. Take action: practice the windmill exercise without a kettlebell to get used to the movement before progressing to holding a kettlebell overhead. Your goal is 5 reps each side. The overhead kettlebell squat is a challenging exercise that requires good upper back mobility. It goes without saying that you should already be able to perform good squats before attempting this exercise. 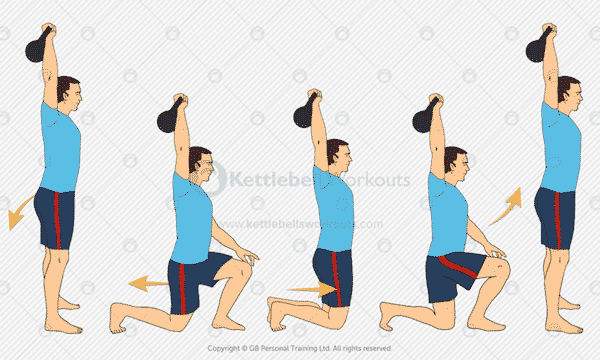 Holding the kettlebell overhead sit back onto your heels as you drop down into the squat. Keep your chest up and arm locked out straight throughout the entire exercise. Brace your core muscles tightly to prevent an overarching in the lower back. If you find your body is falling forwards when you don’t have the same issue when performing the goblet squat, then your upper back (thoracic spine) is the reason why. Working through some upper back mobilisation exercises will certainly help. It is important to realise that although the shoulder needs to be mobile you don’t want it to be hyper-mobile to compensate for a tight upper back. Take action: progress to 10 reps each side. If you can’t perform the overhead squat work on your upper back mobility on a daily basis. The kettlebell overhead lunge will challenge your shoulder stabilisers while at the same time strengthen your legs, core and buttocks. Make sure you lunge well with good technique before attempting this exercise. Holding a kettlebell overhead will shift your centre of balance and increase the demand on your core muscles. Keep your core tight and be very careful not to overarch at the lower back. The reverse lunge is the easiest lunge variation to begin with, followed by the forward lunge and finally the walking lunge. As with all overhead exercises the arm should remain locked out, the wrist straight and shoulders away from the ears. Take action: master the lunge first and then progress to 12 reps on each side. 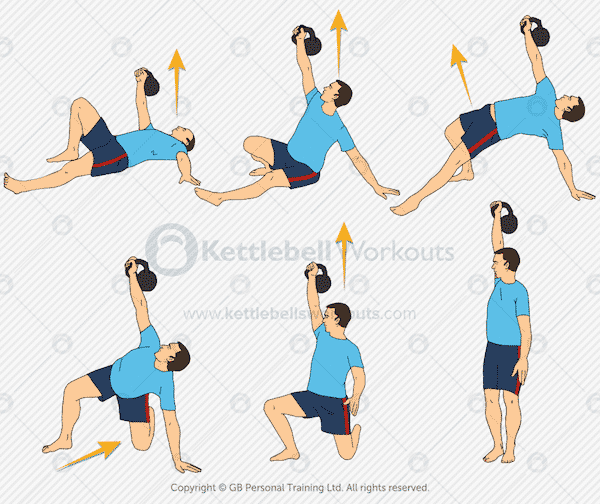 The kettlebell Turkish get up is the most technical of all the overhead kettlebell exercises but by far the most all encompassing. Practitioners of the Turkish get up will achieve strong shoulder stabilisation in all positions as well as a more functional core and improved mobility. Beginners should start with the half Turkish get up which involves moving from the lying position to sitting with the kettlebell overhead. You can work through several repetitions of the half get up on each side before progressing to the standing part of the exercise. As with all these overhead exercises a straight wrist, locked out arm and shoulder kept back and down is vital. Take action: practice without a kettlebell first before adding load. Next, progress to the half get up before the full exercise. 10 full repetitions alternating sides each time is the ultimate goal. The kettlebell straight arm sit is a demanding core exercise that also works the shoulder stabilisers from horizontal to vertical. Keep your legs straight and arm locked out straight as you sit up. If you struggle with tight hamstrings then you may find that your knees bend slightly. 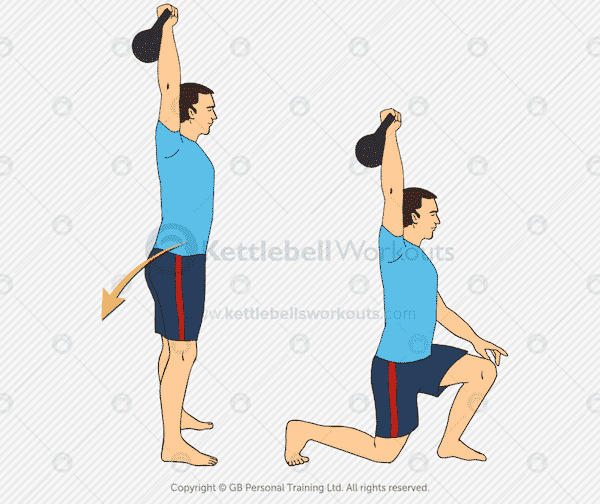 You can use the kettlebell to assist in the hardest part of the exercise by angling the arm slightly in front of vertical as you start to sit up. At the top of the exercise lift the chest up and keep the shoulders back and down. Lower from the top position back to the floor slowly over 3 seconds resisting the pull of gravity. Take action: progress to 10 repetitions on both sides with a 3 second lower for each rep. If you want to add further demands to the overhead position and force your shoulder stabilising muscles to work harder then you can use the bottoms up position. Beginners should practice the bottoms up clean exercise before attempting this variation. 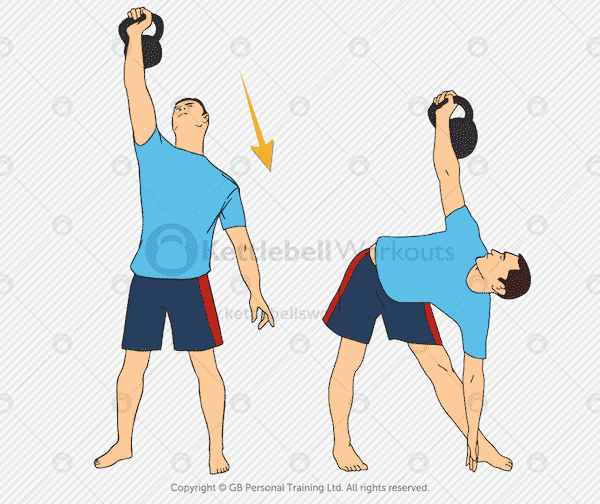 Once you feel comfortable with the bottoms up clean you can use the kettlebell overhead and hold it there. The bottoms up position is not about having a strong grip but more about good alignment. Be careful that the kettlebell does not flop back over and hit you, always be in an area where you can quickly get out of the way and drop the kettlebell. Take action: start with the bottoms up clean aiming for a 5 second hold before progressing to the overhead hold. The shoulder stabilising muscles are often neglected in favour of the larger prime mover shoulder muscles. Learning to hold a kettlebell overhead while you move your body in various ways underneath it will strengthen your body’s framework. A strong shoulder stabilising framework will result in less injury and a stronger platform for your larger shoulder muscles to operate from. Above I have listed 7 shoulder stabilising exercises that you can use along with examples of how to use them. Always remember to never press overhead what you cannot hold overhead and you will have strong and healthy shoulders for many years to come. Have you tried any of these overhead static kettlebell exercises? Let me know below….